Observant CairnsBlog readers will have noticed a new poll that has just appeared on line. Here's your chance to tell the readership (and my legal team) who you don't support and who are therefore, our most loved Cairns Regional Councillors - our civic leaders par excellence. There's some immediate predictable trends, but anything's possible over the next couple of weeks. 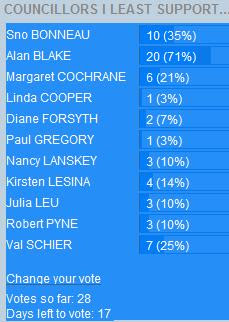 I have no idea of how accurate this "vote" is...however if it is any indication of voters intent, then Julia Leu and Di Forsyth look like they may the only two of the current line-up to be re-elected next election!! !